I have almost migrated to Google Chrome browser. For last 2-3 months I am using it as default browser, as of now it has got a lot of useful extensions which add many new features while browsing. While I updated it from previous older version to new one, it started reacting as I had done something wrong to it! Report like “ Chrome stopped Working “ became an usual on my PC. After few minutes of browsing, it suddenly crash and restart. In such situation the flow of work get disturbed. Not only this for some sites like orkut and twitter, while opening them blank or some coded page was appearing. Neither cleaning browsing data nor re-installation helped. But fortunately yesterday I got a working solution which is quite easy, lets start with solution. 1. Close Google Chrome browser, then. 3. Now Delete the “ Local State “ file permanently. 4. 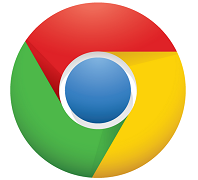 Start chrome and see whether it is working properly. 1. Click on the Google Chrome shortcut. 2. In Target field add “-no-sandbox” or “-in-process-plugins”. 3. Click Apply and Try starting Chrome again. If even this is not working in your case, then may its an issue with one of the windows file named as “winhttp.dll”. Then try this. 3. 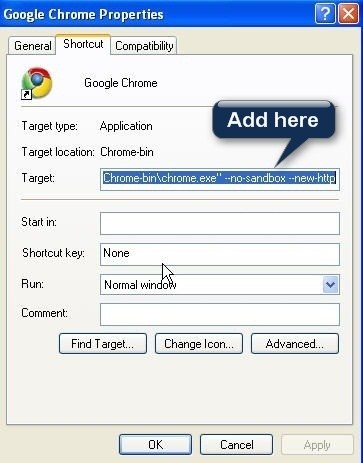 Click Apply and Try starting Chrome again..
Hope this will definitely help you, if you have any problem then leave comments below. This really fixes the problem?? Yes, of-course this tweak fix crash problem. I have already tried this on 3 PCs and is successful. actually what is that user data folder is for ? why are we deleting that ? @Srivathsanuser data folder contains user's profile info.If you are facing the problem again then delete "Local State" file in user data folder…this can also solve your problem. This process will not uninstall the existing extensions. still not working .. i follow your instructions, still crashin like this message "Whoah!Google Chrome has crashed. Restart now?" @Google Chrome UserSometimes changing compatibility mode to Windows Vista also works fine. This is the case with few users who reported this tweak is working. Hope this will also work for you. And before changing compatibility, don't forget to remove others tweaks(above), which you did earlier. The Option -no-sandbox makes it works but it says the stability and Security Suffer !!! where do you think the problem is, in Registry maybe? I need to run Chrome normally. Hope this will definitely help you out. And if you are using Internet Download Manager, then remove advanced integration setting from IDM, as this makes chrome unstable. Wen i open twitter,orkut,flicker and some other sites. they wer not opening and showing some code. i tried all the 3 tricks but no result. Please uninstall the older version of Chrome and then re-install it again. Use onsite-installer to install the latest version. thank you very much. 1st solution helped!! Hi Gower, you can use Standalone install version of Google Chrome for this purpose. Dude, I rarely say this to anyone. U R GOD…..
After tirelessly searching for two days for a solution U r the one who helped me get my chrome back again and running. Can’t repay u for this bro. I used all those but none worked out what to do? Will inform you very soon. Open chrome in incognito window. Open settings and disconnect your google profile. It is good to delete all the files from C:\Windows\Prefetch folder regularly. We can delete the Prefetch folder itself completely, after deleting the Prefetch\Readyboot folder. Thank you so much for the updated trick.